Do you need a shed? An often asked question when carrying out work on a boat, the answer to which I would argue is – Yes. I originally thought the restoration would take 18 months, but here we are two years later, with the project only two thirds completed. 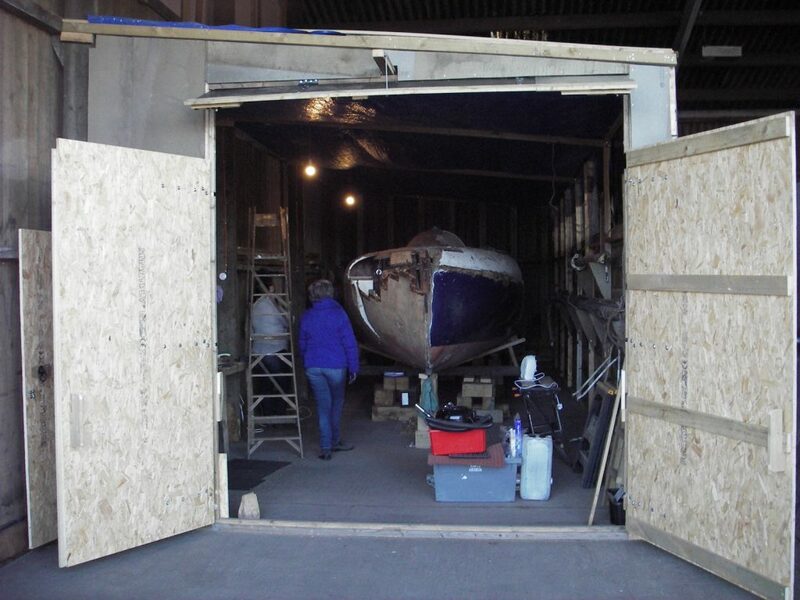 So having a secure, waterproof and windproof space in which to work on the boat is essential. Size does matter – you will need, as an absolute minimum, four feet clear space round the boat (and the trailer if the boat is sitting on it) as well as a similar distance above the boat. And that’s not allowing additional floor space for work bench, tools and materials. You will need power – for lights, tools and heating – nothing huge, but working with torches using battery tools quickly loses its attractions, especially when the weather is cold. Location is also important. If you are only planning a few visits, then it’s not too much of a bother if the boatshed is some way away from where you live. And think about creature comforts such as making a brew or facilities for when you get desperate a couple of hours later! I was fortunate in finding a space, open on two sides, which was more than big enough. The main problem was that it was open – with all the potential problems with weather, security and in my case, prolific rodents. 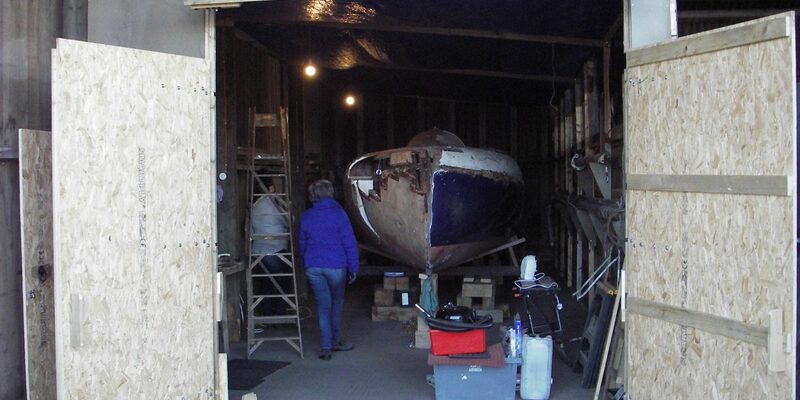 After agreeing with the landlord, I built a secure(ish) boatshed within the space. The shed is still there, but I moved “Atalanta” from the shed at the time of the AOA60 events back in August 2018. 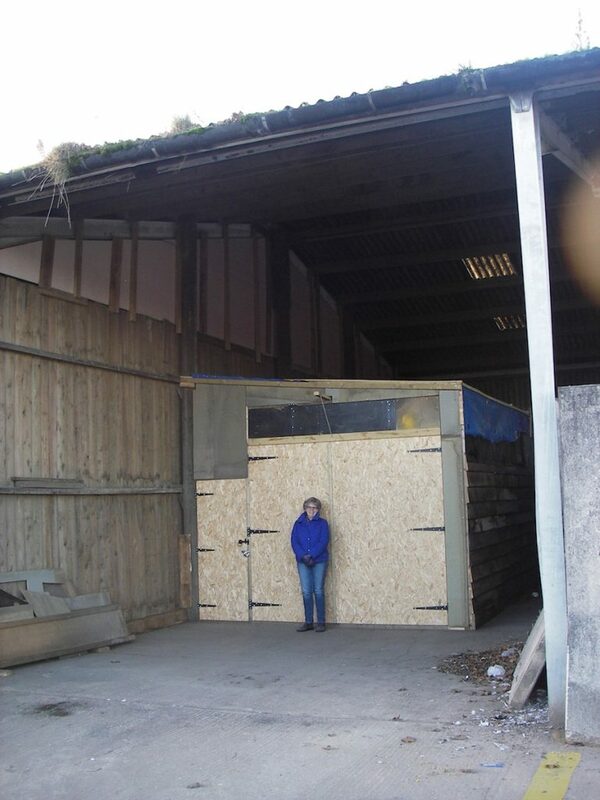 The ‘boatshed’ that I built for A1 was 40’ long, 16’ wide and 11’ high (12 x 5 x 3.5 metres approx.) – just about right, but cramped at times when there was a lot going on such as cutting out pieces of ply from 8’ x 4’ sheets. The shed had a good concrete base, as having a damp and wet earthen floor is not good. It had more than enough power for my needs. And crucially, it was only two miles from where I live, so nipping home for that vital tool or piece of equipment was a matter of minutes. Being able to go to suppliers and home for lunch also contributed greatly to the overall success. Cost – yes there was a cost – in my case £100 per month which included the cost of electricity. Not cheap, but less than other quotes for premises further away from home. But – and very importantly – well worth the outlay in terms of peace of mind. Having built my boatshed, installed the boat and jacked it up onto substantial oak timber beams resting on very sturdy blocks, I could begin to investigate what I had taken on. I had some idea of the scale of the project from my initial viewing some three months earlier, but came to realise quite soon that there was much much more to be done than initially thought. Taking off the rubbing strake, which covered the joint between the hull mouldings and the topsides mouldings, (mostly, it just crumbled away as a rotten length of wood) revealed the damage to the veneers just about the full length of the boat on both sides. There were holes in the hull, the topsides, the decks – in fact walking around on deck was quite exciting if you didn’t place your weight on the deck beams. The entire foredeck was sheathed in glass-fibre resin and matting. Lifting the matting revealed the poor state of the deck veneers beneath. 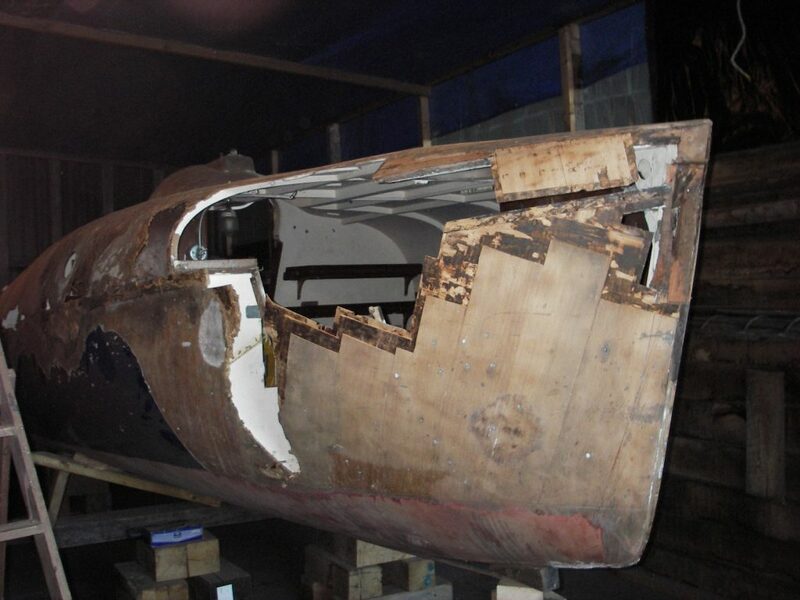 The keel boxes and the rest of the cockpit – the transverse bulkheads and locker seats – were shot and would have to be replaced. 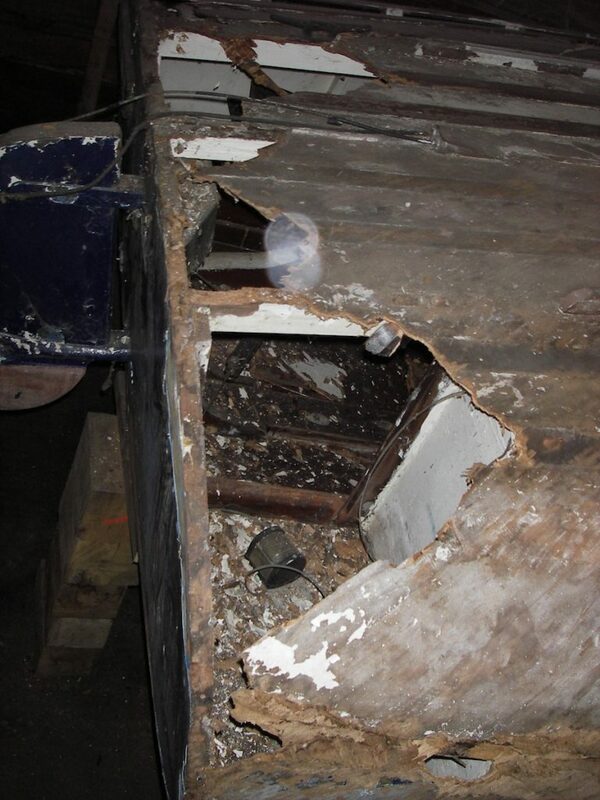 Later on in the investigation, I found that the interior of the keel boxes had been sheathed with fibre-glass matting as well – on top of mud! The wooden transom (solid mahogany) was basically sound, though there was some rot along the top edge in way of the deck veneers. Various fittings had been attached to the transom over the years with a myriad of plugged and filled holes. I knew that the keels would have to come out so took a closer look at the keel support brackets. Being the prototype, A1’s arrangement was very different to that of subsequent production boats. Clearly a lot of work to be done there. The engine was suspect and the ancillaries non-existent; more thought required on these. The stern gear would need replacement as well. The mast, boom and other spars all seemed sound, though the rigging was original and tired. A lot of the fittings were of mild steel and badly corroded. There were no spreaders and only part of the diamond stay struts were there. Sails were available, but they transpired that they were not as ‘modern’ as expected. New sails required as well! There was no road trailer. If I were to transport the finished boat around, I’d need a sturdy road trailer to achieve this. And a suitable vehicle to tow said boat and trailer. The rudder stock was all there, but there was no rudder blade. The latter would have to be sourced from somewhere. All of this initial investigation coalesced into a rough idea of what had to be achieved, which was a lot more work than had been envisaged when I looked at it initially. Did I make a plan? – no. Did I create a budget? – no. Did I have a timescale? 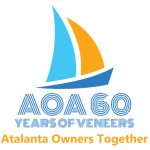 – sort of, as the 60th anniversary of the Association was taking place in 2018, and I was sure (wrong on so many counts!) she would be ready in time. The first principle that I formed at this initial stage was that I would, wherever possible, restore “Atalanta” in such a way that she would look – on the outside at least – the same as when she first took to the water in 1955, but using modern materials and paint. I took the view that, rightly or wrongly, she would have been built using the latest developments at the time, so there was no reason why the restoration couldn’t benefit from subsequent improvements. The second principle I adopted was that I would keep as much of the original boat as was prudent, though have no hesitation in replacing items that had clearly become ‘beyond economical repair’. I reckoned two principles were sufficient!